Are weeds sprouting up through the cracks and crevices of your patio? Are you afraid of using commercially available herbicides or just too lazy to manually weed them out? Weeds not only make your garden look unaesthetic but are also known to cause huge damages to crops. It is estimated that in Australia, farmers spend around $1.5 billion a year on weed control activities and a further $2.5 billion a year in lost agricultural production. While large-scale weed control in agricultural farms requires industrial herbicides, you can remove them from your garden by using products that are readily available at home. Bright Side brings you 9 simple ways to remove weeds using things that you’re sure to have at your home and are not hazardous to the flowers that you have so lovingly grown. Prevention is better than searching for a cure. To prevent weeds from growing, sprinkle the cracks and crevices in the area in which the weeds grow with baking soda. But in case you already have weeds in your garden, baking soda can come in handy in such a case too. Use 1 tbsp of baking soda to coat the entire weed plant including its stem and foliage. 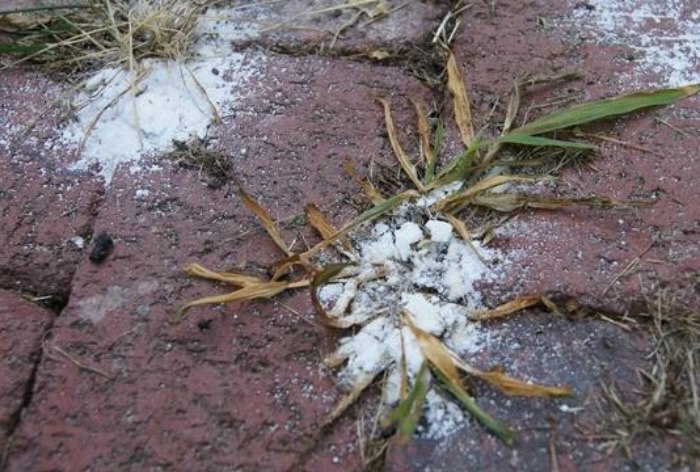 Weeds can be tough to eradicate, but table salt can effectively do the task. Just pour the salt directly on the weeds. Alternatively, you can also make a solution of about 1 cup salt in 2 cups water and let it boil. Spray the boiling solution directly on the weeds to kill them. Wet a few sheets of newspaper and cover the weeds with them. This method is known as smothering as it deprives the weeds of any light, air, or room to grow, which eventually kills them. Cornmeal can be used not only to prevent weeds from growing but also to kill the weeds that have grown. Sprinkle cornmeal where you expect weeds to grow or on already existing weeds. It will kill the weeds just as well as it will stop them from growing. Spray the flowers or the midsection of the weed with full-strength white vinegar or apple cider vinegar. Repeated applications may be necessary, especially if it rains after the vinegar was applied. The acid in vinegar is perfect for shriveling weeds, just be careful to minimize any overspray on garden plants and nearby soil. What else can be the cheapest and the most readily available substance to get rid of weeds if not water? Boil a kettle of water and pour it carefully over the weeds for a chemical-free way to purge your garden. The huge amount of chemicals found in most weedicides can be worrisome for some gardeners. So why not make one at home? Mix vinegar, table salt, and dish soap in equal parts in a bucket. Pour it into a spray bottle and spray it over the weeds. Another way to smother weeds is by using mulch. The best way is to cover your garden with a nice layer of mulch. This will not only cover and kill the lower weeds but the mulch cover will also effectively hide the weeds even after they are dead. For the vodka lovers out there, you also have an effective weedicide in your bottle — just add 30 ml of vodka and a few drops of liquid dish soap to 2 cups of water. Spray this mixture over the weeds. Alcohol can stunt the growth of plants, or even kill them if sprayed with a higher concentration. It’s important to remember that this method works only when the weeds are in direct sunlight, so it is not applicable for plants that are inside. What do you think about the 9 all-natural ways to remove weeds from your garden without harming the flowers and plants around? Do you have any other tricks? Share with us in the comments below!